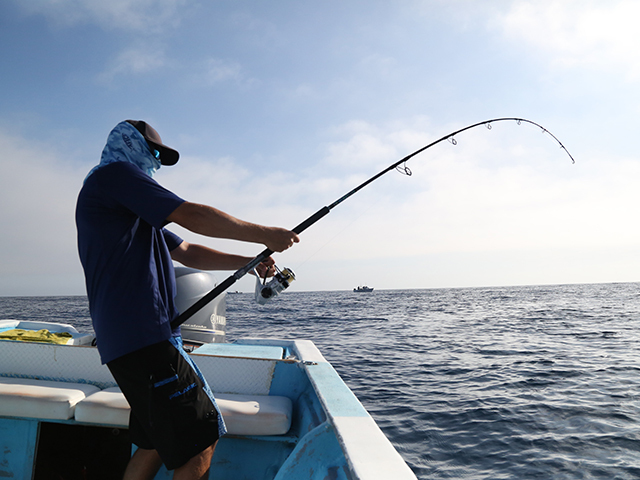 Knowing how drag works will help you stop a fish..
To increase drag pressure during the fight, an angler can pinch the line, thumb the spool or bend the rod hard. Knowing your gear and how much pressure it can withstand makes all the difference. Photo courtesy of Accurate Fishing Products. 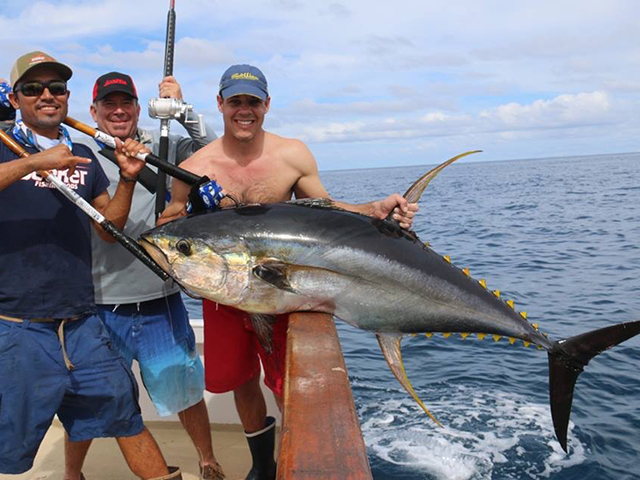 Big fish, like this yellowfin tuna, require an aggressive drag that stays constant through the fight. Photo courtesy of Accurate. Most spinning reels use oiled felt drag washers. This system provides smooth starts and even drag pressure. Back off the drag between uses to extend the life. Photo courtesy of Okuma Fishing Tackle. The right harness fit properly will allow an angler to make the most of his drag system. Keep the rod bent at no more than 45 degrees to apply pressure without snapping the line or the rod. Photo courtesy of Okuma Fishing Tackle. More anglers are using spinning gear for big fish because the drag force is projected downward through the reel. 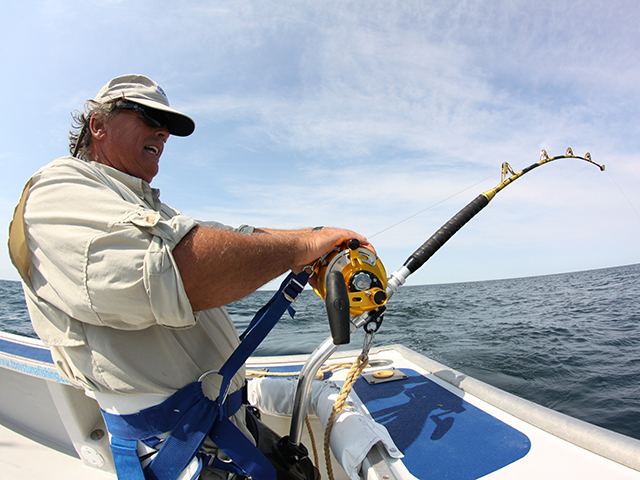 With a conventional reel, the angler has to curl his forearm to keep the rod and reel upright. Photo courtesy of Okuma Fishing Tackle. Do you know what's inside your reel? When victory is on the line, understanding how your reel's gears, shafts, bearings and drag washers get the job done will help you win the end game. To get a better understanding of what makes a fishing reel work, we asked a couple of experts in the industry to shed some light. First, it’s important to understand how the drag inside of a reel works. Regardless of the system or materials, all drag systems use a series of disks or washers connected to the spool. When a fish makes a run, the washers rub together to slow the spool, apply drag pressure and slow down the movement of the fish without breaking the line. However, when moving parts that are under pressure make contact, trouble is never far behind. 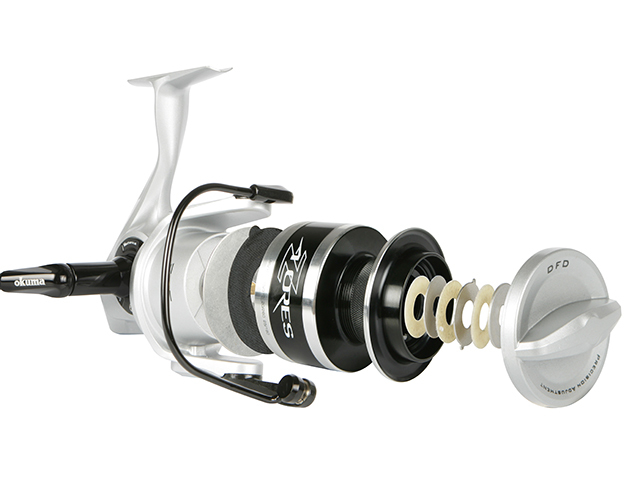 For conventional reels, there are two types of drags, the star drag and lever drag. Star drag uses an adjustment dial (shaped like a star which makes it easy to turn with a thumb) to set the drag pressure at a constant value. The drag pressure can be increased or decreased during the fight, but the angler may not know exactly how much pressure he’s adding when using a star drag. A star drag is set at a constant value. This makes it possible to immediately engage the drag from free spool. Also, the drag maintains one setting throughout the fight. This can be good for light tackle when giving in to the temptation to tighten the drag may result in a breakoff. With a lever-drag reel, the angler can increase the amount of drag by pushing the lever up. This allows the angler the freedom to adjust the drag from bite to strike to full in more exact increments while fighting a fish. 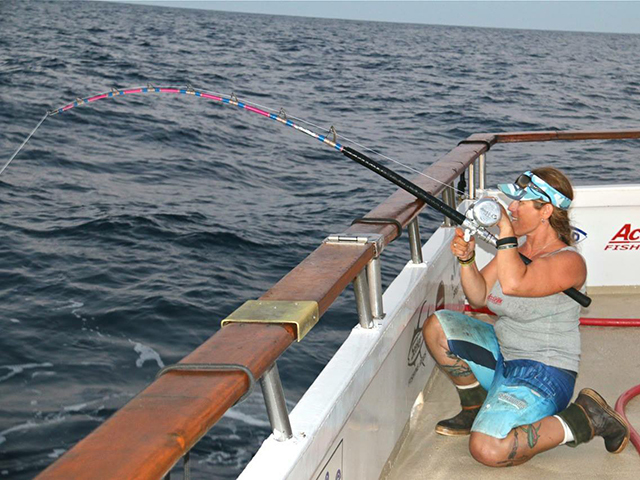 For offshore trolling and world-record seeking, most anglers prefer the lever-drag reel because you can test the drag at all settings and label the reel. One problem both drag systems suffer from is heat. When drag washers rub together they produce heat that must be transferred out of the washer and away from the spool. As the heat increases, the preset value will increase. Okuma adds a coat of grease to its carbon-fiber drag washers to repel water and improve drag performance. “Drag materials and construction differ greatly,” Bretza says, “it’s best to match the drag to the fish you target.” The type of drag washers used in a reel is one of the factors when it comes to the cost of the reel. Higher priced reels utilize more expensive materials. Some reels offer composite drag washers, which are cheaper than carbon fiber. These systems work well out of the box, but don’t live as long as carbon. The simple solution is to switch out the washers for carbon fiber if you plan to put the reel through repeated use under extreme pressure. If you don’t push the reel to the max day in and day out, it may serve you just fine. Ben Secrest, a lifelong angler and VP of Marketing for Accurate Fishing Products based in Corona, California, is quick to explain why Accurate uses a twin-drag system on its conventional reels. “Having a drag washer on each side of the spool evens out the drag pressure over twice the area,” he says. Using drag washers on each side of a conventional reel helps to improve balance and spread out the drag pressure. When a fish makes a run, you do not want the spool to stutter and give out short blasts of line. You want a drag that is slow and consistent. “If the drag is set at six pounds, then it should take six pounds of pressure to start the spool spinning,” Secrest says. Another consideration is cam angle. Bretza points out that the angle of the drag cam can affect start-up inertia. “A more aggressive cam angle is best for heavy drag and big fish,” he says. A less aggressive cam, on the other hand, works best for light drag and light line. Unfortunately, there is no way to test drag quality in the store. Most reels will be smooth and consistent out of the box. Even turning the spool with the drag engaged can be affected by spool tension. “The best thing to do is check the quality of the components and construction,” Bretza suggests.